splash! (172), finding dori, i don’t care! i love it! and you wow’d me again. I haven’t done a side by side swatch comparison though they look close. What do you think of these? And let me know if you’d like to see a side by side swatch comparison of the ones mentioned. As of today a new collection by Miss Sporty is available at selected stores. Three new Candy Shine Glitter Effect polishes have been added to their range. These three glitter bombs have no names but are numbered instead: Today I’d like to show you the green one, number 1. This is a clear base packed with green and holographic glitter in a variety of sizes and shapes. There are also some tiny green bar glitters in the mix. The formula is good with a nice glitter payoff. I chose to use a peachy pink polish as my base color. Shown is one coat layered over two coats of A Gallon Of Melon by Catrice. I topped it with one coat of top coat for a glossy and long lasting finish. The Candy Shine Glitter Effect polishes are now available at selected stores (7ml each). 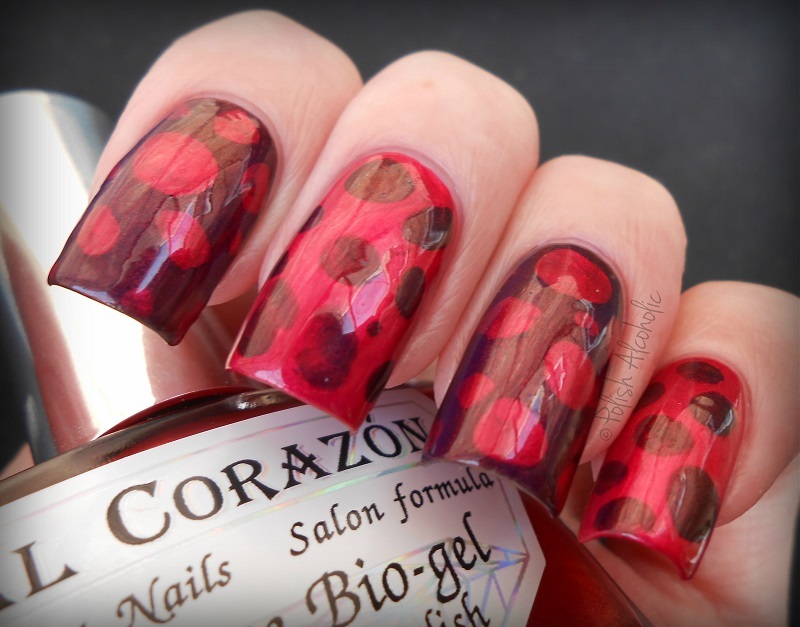 I’m back with two more shades from the Nail Party Collection by El Corazon. For this mani I used Strawberry Margarita (423/626) and Long Island (423/622), both two easy and super glossy coats. Because I added some kind of dots I did applied one coat of top coat. These polishes are super glossy by themselves. 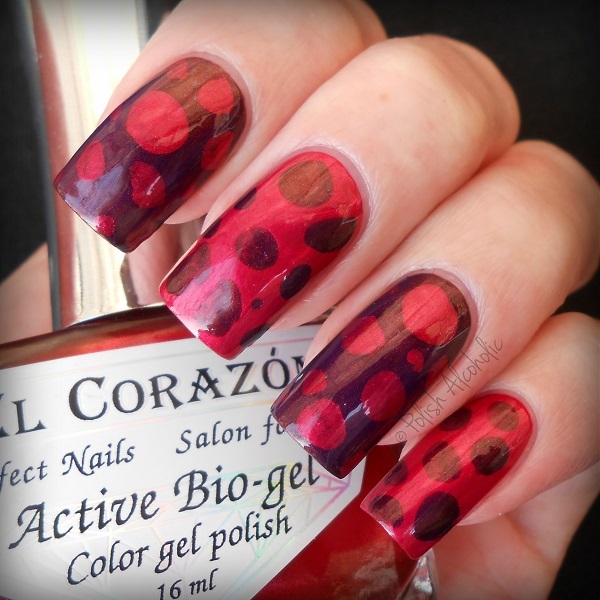 You can find El Corazon polishes at their website. 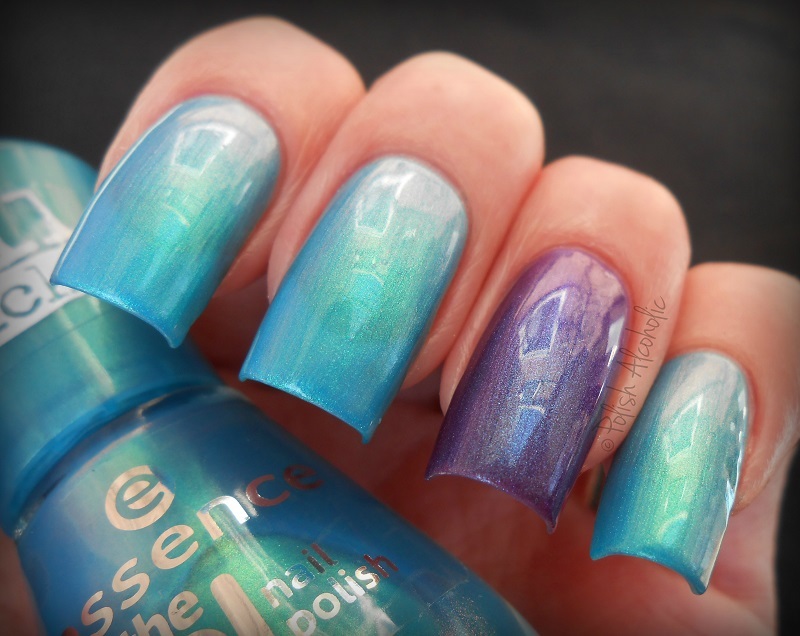 This collection isn’t available yet at Hypnotic Polish.